The story of the Mothman comes from West Virginia folklore where a local spotted a man-sized bird creature in 1966. The press picked up on the story and it spread across America and further sightings have been seen over the years. Now that little bit of backstory is out the way, this film MOTH deals with a teacher and student investigating the apparent resurgence of sightings in Hungary. Once they arrive in Hungary the film turns into a road trip with both of them telling each other their life stories in a less then exciting adventure. Things do pick up though when they come across abandoned cars, blood, a mysterious dust over everything and a clicking noise that seemingly follows them. Their investigation takes a turn later when they find a home to rest in, but is everything what it seems to be? The majority of the film is shot on handheld cameras and at times the sound is muffled which some could find off putting. The 2 leads are easy to watch and you do feel close to them through the telling of their back-stories even if the dialogue feels stilted. 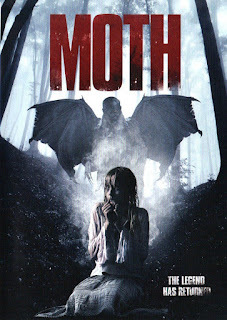 I was really hoping for a good Mothman film and though this has a decent plot twist the film in the end leaves you underwhelmed. Still its worth checking out if you like found footage movies and enjoy a good mystery.